Here is this article I will share you all the secrets for Direct Admission Engineering which you can implement to get direct admission in engineering colleges on the basis of 12th marks. Normally, many students get confused which colleges to join for higher engineering education, as there are only a few students who are able to get a seat through JEE Mains. Nowadays, to get a seat in a government college is very hard due to the fact more than 10 lakhs students apply for few thousands of the seats. What about the rest of students who cannot score or write the entrance exams? To give a chance to the students to study in top engineering colleges, private colleges owners made a special provision for direct admission in engineering colleges through management quota seats also known as the institutional quota. To join some of the top engineering colleges you can directly ask the colleges trust for direct admission through management quota by paying a donation fees also known as development fees directly to the college. What is the total amount of seats in a particular college under management quota? The total amount of seats under management quota is limited to 25% of the total seats in a particular engineering college. A candidate who has scored more than 45% in physics, chemistry, and maths can go for direct admission in engineering colleges. How to get a direct admission seat in engineering colleges of Bangalore? Admission is based on first come first serve basis as soon as the 12th results are out admission in engineering colleges of Bangalore starts and seats booking can be done by paying a part of donation fees to the individual colleges. Direct Admission In Engineering Colleges Without Donation in private engineering colleges of Bangalore, Karnataka. Admission and seat booking to be done immediately as soon as the results for higher secondary schools are declared, apply for entrance exams and visit the college trust for direct admission based on institutional quota seats. Join the best engineering colleges by paying a donation to the colleges and applying to the particular colleges’ entrance test as soon as the higher secondary school results are declared. Direct admission in Narsee Monjee Institute of Management studies. List of Engineering Colleges in Mumbai_ Click Here to know more. Join top engineering colleges of Chennai by paying only colleges fess. In some Colleges in Chennai few top colleges will ask for management quota fess per year applicable for 4 years. List of Engineering Colleges in Chennai _Click here to know more. Management quota seat fees are decided by the trust of the colleges and the same fees are collected from all the students who wish to join the colleges, every year colleges review their donation fees and make some changes if required. Some of the colleges also provide direct admission in engineering colleges without donation on the leftover seats institutional quota seats in a low budget package. Students get a chance to study in their dream colleges. Direct admission gives a chance to study in top engineering colleges. Marks card of 12th exams. Marks card of 10th exams. JEE mains results or any other exams results. Passport size 5 photographs of the student. College tuition fees and hostel fees. Other documents issued by the school like migration certificate, transfer certificate. These are the few documents required for direct admission in Engineering Colleges. In order to find the right college for direct admission, we need to look for private engineering colleges which are located in top cities and have good placements record. We need to discuss with someone who has good knowledge about engineering colleges or with someone who is studying in private engineering colleges. We can also search on some educational website for private engineering colleges. We can also get information from newspapers and other educational magazines. 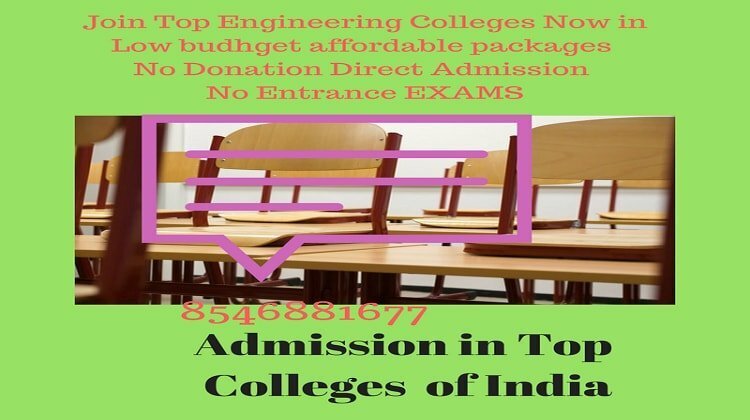 If you still find it difficult to select the colleges for direct admission in engineering colleges without donation contact for career guidance and admission guidance in private engineering colleges. Some of the private engineering colleges have some percentage of the total seats reserved known as management quota seats to give students a chance who are not able to clear any entrance exams or not have written any entrance exams for direct admission in engineering colleges without donation. Management quota seats are available in most of the private engineering colleges and anybody can join on management quota seats. The minimum percentage criteria for direct admission is 45% in physics, maths and any other subjects in 12th exams. To know more about management quota seats for direct admission in engineering colleges without donation contact educational & admission agencies. Anyone who is studying in private engineering colleges can help for direct admission in that particular college or else an education consultant can help for direct admission in engineering colleges. Education consultants can give information about all private engineering colleges for Direct Admission In Engineering Colleges Without Donation. Contact for admission guidance, career counseling and for any other help regarding admission our visit our website home page for more information. We provide admission in private colleges. We do not charge any fees for admission guidance and career counseling. Feel free to contact for Direct Admission In Engineering Colleges Without Donation. Truth: Engineering direct admission is only possible in private engineering colleges. Lies: Engineering direct admission is not possible in government colleges. Truth: Direct Admission In Engineering Colleges Without Donation is possible in most of the colleges. Lies: Direct admission in engineering is not possible in some of the top 10 colleges without donation, top colleges in especially in Bangalore will ask for some donation for direct admission. Truth: Direct Admission In Engineering Colleges Without Donation can be done in college fees without any extra fees or charge. Lies: Some of the private agencies or person will promise direct admission in top colleges without donation or in very less price which is never possible to con the students in the name of admission. Truth: Some colleges may ask for a donation which can be negotiated if you consult someone who has the good approach with the college’s trust and trustees of colleges for admission guidance. Lies: Some top colleges donation cannot be negotiated for some particular branches of computer science and information science because the demand of the seats is very high. Sign up Newsletter for daily email updates on colleges and admission by filling the form. Kindly inbox me your 10th & 12th results. I am looking for Admission in B.Tech. I got 75% in HSC. And scored 72 in Jee Mains. Please ease the admission through management quota with minimum fees. I am from categorized as EBC. Economically Background Class. We barely get 98,000 per year And my father can bar 30K per year. Please, I have caste certificate OBC. Please, sir, help me out. Can do in 50 Thousand Per annum fees in ComedK Engineering Colleges. Apply for Manipal University Online Entrance Test (MU-OET) 2018 for B.Tech Admission. Please guide me for admission in best engineering colleges. Contact 8546881677 for Direct admission in top engineering colleges. I want management quota admission in MIT Pune main campus for mechanical engineering..pl.tell about the process. Apply for MIT University, Pune online admission application. B Tech in CSE admission procedure? Class 12th pass with 45% marks in Physics, Chemistry, Maths for B.E/B.Tech direct admission. Please let me know some engineering college in New Delhi or New Delhi NCR which give admission on the basis of +2 marks. Amity University, Lovely Profesional University. Got 60 marks in JEE Mains just short of the cutoff. Wanted a college which can offer me the best of computer science. how to get direct admission in Manipal MIT. Admission in Manipal Institute of technology is done only via entrance exams (MU_OET). Sir, what will be the total fees for BTech in ECE through management quota(with donations n fees) in rv, pes, BMS? N also in Mumbai colleges like KJ Somaiya n Sardar Patel college? My 10th percentage is 81% aggregate n 12th is 70% aggregate. You can download Management Quota Fees structure from our website. Sir my 12 class 65% and class 10 is 75%. Can I take admission through management quota in Bangalore Institute of technology? I looking for my son for B Tech / B. E. (Mechanical) direct admission through management quota. I want to get admission in MIT Pune but I have not given any entrance exam. 104 in Muoet and I need CSE in Manipal University main campus. What do I do? The rank, counseling schedule, venue and other relevant details, will be made available on the Manipal University website. I have scored 89.66% in PCM in the 12th board from ISC. Can I get admission to RV college of engineering without a donation? I want to take admission in bits. And today was my Bitsat exam and I got 63 marks. Sir is there any chance by which I can seek admission in Bits Pilani?? I have 72% in 12. I want to get direct admission in college. My 12th percentage is74.2%, Can I get any government college? Apply for entrance exams for admission in Govt. colleges. I want to take admission in MIT Pune but I have not given any entrance exam. Is that possible? I want direct admission in BMS, RV, or MSRIT in Mechanical engineering. Suggest me good colleges for computer science? I got 75.8% in CBSE boards. My AIR in jee mains 2018 is 74145 and Comedk rank is 35000. Sir, I got 79.6,% in 12th standard. So I want to take direct admission. Plz, help me join any good college in Bangalore. I want to direct admission in Bangalore. I want to take admission in Mumbai college. I got 49% in physics. Admission in Engineering Colleges in Mumbai via MHCET Entrance test & Counseling. I have scored 81 percent in 12th board exam, want admission in any top 10 engineering colleges in Bangalore at no donation or at minimum cost. Plzz Guide me. Join Ramaiah University of Applied Sciences. Want admission in engineering college in Aerospace engineering or Computer engineering. Contact us for admission in Top Private Engineering Colleges of Bangalore. How can I contact Admission Backup? I have scored 81%in 12 standards from CBSE board. I want to take admission in top 10 engineering colleges in Delhi without a donation. I have scored 81.8% in CBSE year 2018. But in JEE I have been missed out and want to admission top 5 colleges in civil engineering at Bangalore without a donation. What is the chances and expected expenditure. In 7600 Rank RVCE CSE is not possible, Through ComedK Counseling. I have scored 82.6 % in 12th from Jharkhand board and got 67 marks in jee main 2018. I want to take admission for B.Tech in CSE please help sir. I can help You with direct admission in Private engineering colleges. Sir, I have 94.4% in intermediate and I got 21 marks in jee mains please find the best college for direct admission into BTech? Best Engineering Colleges are available in Bangalore for Direct Admission. I scored 96.2% in class 12th CBSE board in 2018. Plz, suggest me direct admission colleges in Delhi NCR with affordable fees. In Delhi 1.50 lakhs per annum, In Bangalore only 50 thousand Per annum minimum. I want direct admission in DA IICT Gandhinagar without registering to jee marks or anything else. Can I get there? sir, I am from Nepal and I want to get admission in top colleges of Bangalore. Nepal Students can join top colleges through PIO Quota Seats. Can I do electronic engineering without giving any entrance exam? Can join in Engineering Colleges of Bangalore without any entrance exams. I got 54% in 12th & got in jee 75 marks. I want a seat in electrical engineering without a donation in any college in Mumbai. Ajeenkya DY Patil University, Pune without donation B.Tech seats are available. Direct admission for chemical engineering, my jee rank is 31326 and class 12 marks is 88.2%. Contact 8546881677 for Direct Admission in Chemical Engineering. I got 54 % in 12th from Biharbord and want to join Top engineering college without jee, What should we do? We are here to help Adarsh! Contact us at 8546881677. You must apply for VIT Entrance exam and score a Rank below 1 lakh to apply for VIT Vellore Managememnt Quota seats. In Which engineering colleges and universities, I can apply without entrance exam? Apply for Colleges under State’s recognized Private Universities & Deemed universities. I got 76% in Uttar Pradesh board, I want to take admission in B.tech. plz, guide me? 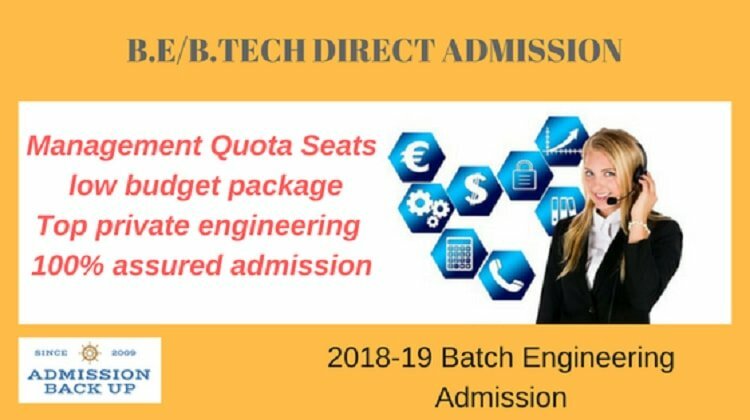 Seat booking for B.E/B.Tech 2019 Academic session is going on, Visit us for Direct Admission in good engineering colleges located in Bangalore, Mumbai, Pune, Chennai & Delhi. Is there a donation should be paid for mechanical engineering, If my 12th mark is 75%? I want to do B.Tech in computer science branch but I didn’t score in any entrance exam. Please guide me for admission in CSE engineering with specialization in A.I. Hey Ayush Tyagi!!! You can take admission in Bengaluru. We can get you a seat for CSE branch with specialization in Artificial Intelligence & Data Science. I want to get admission for BTech civil engineering without any entrance. I got 70% Mark’s in 12th from Jammu and Kashmir board. We offer direct Engineering Admission in all private colleges of Bengaluru, Karnataka. Also, You are eligible for a 50% Scholarship in College tuition fee if You join in Bengaluru. I want to get direct admission in BTech CSE without a donation. Please suggest me some colleges? You can join CSE branch in MS Ramaiah University, CMR University, Presidency University or GITAM university without any donation, book your seats through us to get Scholarship in college tuition fee. I want to know the colleges in Delhi which give direct admission because above there is no list of Delhi colleges? Hi, You can take direct admission in Amity University, Noida campus for B.Tech programs. The list of Engineering colleges for direct admission in Delhi will be available shortly. Sir, I want BTech Computer Science from any college in Delhi? My jee score is not good but I would get more than 90% in Class 12th boards exams. You can take direct admission in Amity University, Noida campus through us. I got bad marks in JEE main but I want admission in a good college. You can join in Bengaluru, Karnataka. I got 62% marks in 12th from Bihar board. I want to take admission in best engineering college. Plzz guide me. Contact us on 8546881677 for direct admission in Top engineering college in Pune, Bengaluru, Mumbai, Delhi, and Chennai. I scored 76% in class 12th ICSE board and 72 percentile in jee mains. Can I get admission in a good college through direct admission? Hi Ayushi, You can join in B.E/B.Tech in Top Engineering colleges of Bengaluru & Chennai. Contact us on 8546881677 for seat bookings. I didn’t give any exams like jee mains or state level exams. Can I get admission in any college through direct admission? Hi Manish, You can get direct B.E/B.Tech Admission in Top Engineering College of Bengaluru without any exams. I scored 84% in CBSE boards, and 105 in jee. Can I get admission in RV college in B.tech through management quota? Yes, You can join Rv College of Engineering under Management Quota.